With a torn rotator cuff symptoms include pain across the shoulder, arm weakness and difficulty with activities above or behind your head and back. The rotator cuff is a group of four muscles which control the movement and position of the shoulder. Damage to the rotator cuff tendons can develop through repetitive wear and tear, or from an injury such as a fall on to an outstretched arm. Rotator cuff tears are a common cause of shoulder pain and are often associated with shoulder impingement syndrome. They most commonly affect people over the age of forty, sportsmen and construction workers. 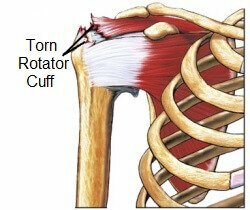 Here we will look how the rotator cuff works, how it gets damaged, common torn rotator cuff symptoms, diagnosis and treatment options. The rotator cuff is a group of four muscles that work together to control and move the shoulder. The shoulder is made up of three bones, the humerus (arm bone), scapula (shoulder blade) and the clavicle (collar bone). The shoulder joint, aka the glenohumeral joint, is a ball and socket joint. The round head of the humerus forms the ball which sits in the shallow socket formed by part of the scapula. 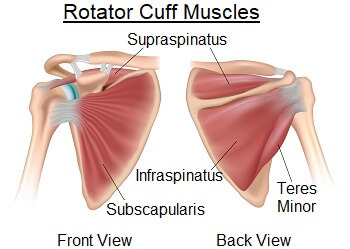 The rotator cuff muscles surround the joint holding the ball and socket together, connecting the humerus to the shoulder blade. Each muscle arises from the shoulder blade and forms tendons which attach on to the humerus. It is the tendon part that tends to get damaged. 1) Supraspinatus: across the top of the shoulder. Initiates abduction (moving the arm out sideways) and stabilises the shoulder during movement. Most commonly damaged tendon. 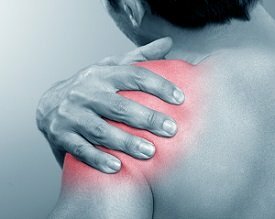 Torn rotator cuff symptoms can develop gradually over time through wear and tear, known as a degenerative tear, or suddenly from an injury, known as an acute tear. a) Repetitive Friction: repetitive activities which involve the rotator cuff, increases the strain on the tendons. Activities where the arm is frequently overhead such as sports with throwing motions or racket sports, occupations involving manual labour and general day-to-day activities above head-height particularly increase the strain on the rotator cuff making it prone to damage. Over the age of around forty, any damage to the tendons is slower to heal as the blood isn’t as good as when we are young, so often tears never get a chance to heal properly and get progressively worse. As a result, you are much more likely to experience torn rotator cuff symptoms over the age of forty. Poor posture can also make you more prone to a degenerative rotator cuff tear. One example of this is a forward rounded posture (known as kyphosis), as it reduces the space in the shoulder joint, increasing the pressure on the tendons. Younger patients most commonly develop a tear from an acute injury whereas degenerative rotator cuff tears and more common in those over the age of forty. 1) Pain: across the shoulder, often described as a dull ache deep inside. The pain tends to get worse when lifting or rotating your arm, with activities such as brushing your hair, or when lying on that side in bed, which often leads to disturbed sleep. As the condition gets worse, you may experience pain even when resting the arm. You doctor will start by taking you history, finding out how and when the pain started and how the arm is feeling, to identify torn rotator cuff symptoms. He will then examine the arm, looking at your range of movement and strength, palpating the different structures and moving your arm into different positions. He may well also examine your neck, as neck problems often present with shoulder pain. Depending on your torn rotator cuff symptoms, he may send you for further investigations, such as x-rays, to look for any bone spurs or arthritis or an MRI or ultrasound scan to look at the soft tissues and identify the presence, location and size of a tear. Treatment will depend on the severity of the injury, as well as the age and activity level of the patient. Treatment should target not just your torn rotator cuff symptoms, but the underlying cause of the problem, such as any areas of weakness or postural issues. In most cases, conservative treatment (non-surgical) is sufficient, but in more severe cases such as grade 3 tears, or if symptoms have failed to settle, surgery may be advised. 4) Steroid Injections: your doctor may recommend a steroid injection to help reduce your torn rotator cuff symptoms. A mixture of local anaesthetic and corticosteroid is injected into the shoulder to help reduce pain and inflammation. You can find out more about how steroid injections work on our sister site. There is no quick fix for torn rotator cuff symptoms and it can take a few months for things to settle down, so it is important to persevere with treatment. They type of surgery carried out will depend on the type and severity of injury. It may be done arthroscopically (keyhole surgery), or through open surgery, where a larger incision is required. During surgery, the torn tendon will be reattached to the bone, any bone spurs will be removed and any other damage will be addressed. You can find out more in the rotator cuff tear surgery section (coming soon). Following surgery, physical therapy is vital to regain the strength and movement in the shoulder - find out more in the rotator cuff exercises section. Recovery usually takes 4-6 weeks. 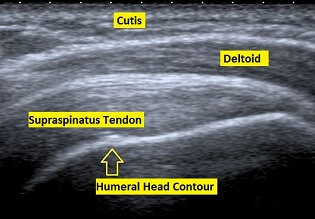 Torn rotator cuff symptoms are often associated with shoulder impingement syndrome, where the tendon is intermittently trapped by part of the scapula or squashed by an inflamed bursa. You can find out more in the shoulder impingement section. Exercises are a really important part of the rehab process to ensure you abolish all torn rotator cuff symptoms and that you regain full strength and mobility in your shoulder - visit the rotator cuff exercises section for a whole range of great exercises that can help.